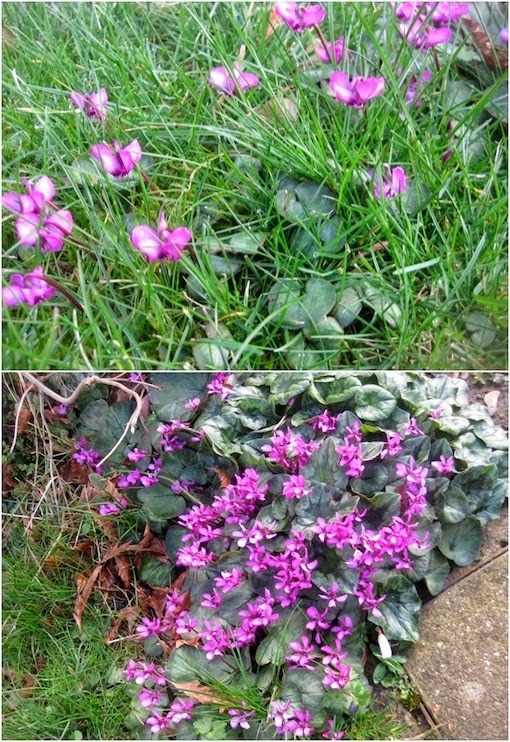 A mark of success is to have large drifts of Cyclamen coum all over the garden. On my sandy soil I fail, my own are fairly insipid. Quite galling really, when I pass my old garden at Bolton Percy, fifteen years after my departure they are quite magnificent. Not my old plants but from their self-sown seed, the original plants were dug up a long time ago by a man with a spade. 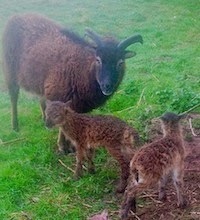 They are now to be found under hedges, in otherwise scruffy neglected corners and on the grass verge by the road. I wonder if the seed was taken there by the ants. I wrote about myrmecochory - I just love that word - in last year's post on Cyclamen hederifolium the easiest of all the hardy cyclamen to grow. 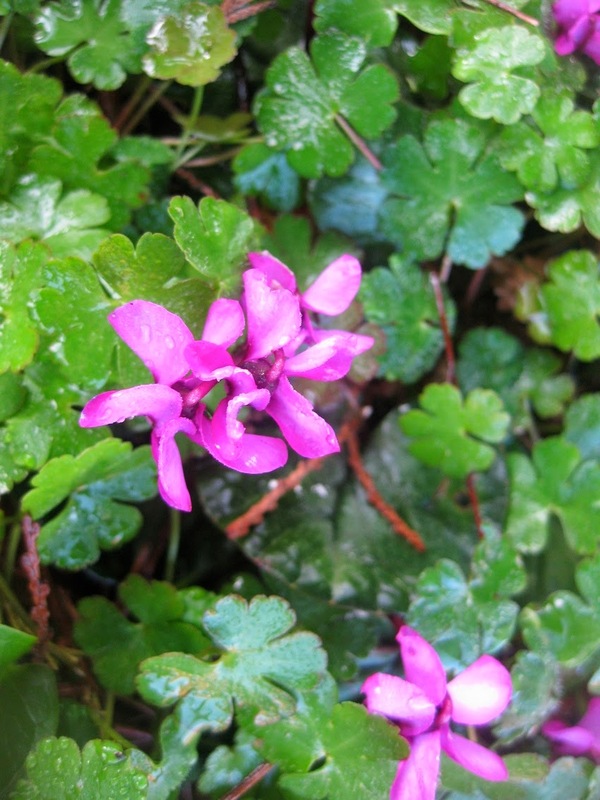 I have some nice Cyclamen coum in my home gravel and rock gardens but they do not spread very well. On the more loamy soil at my old home Cyclamen coum is very easy to grow and provides a lovely carpet of colour in early Spring. It has particularly thrived in this year’s warm February days. My friend Peter Williams made an interesting comment when he noted that you struggle for years to get drifts going and suddenly they reach a critical mass and you can’t stop them! I feel sorry for new gardeners who want to grow these lovely self-seeding cormacious plants. If you buy a packet of seed not only are they expensive you get very few seeds and not many germinate. Failing having a friend who grows them, the best way to build up your numbers eventually to hundreds is to buy a plant and save your own seed. Peter Williams whose fine plants I feature today, bought a rosy red one and a pale pink one at Anglesey Abbey National Trust nursery several years ago. He collected the seed, he got there before the ants and each plant gave him more than two hundred seeds. If not cross pollinated the seeds come fairly true. When eventually you become a cyclamen connoisseur you will have so many seedlings that you can start to become selective and save only the plants with the best foliage markings! The main secret of success with seed is to sow them fresh. Best on the day you collect them. The secret of failure is to buy dry corms. Always buy a plant that is growing! I am particularly thrilled this year by the large pot of Cyclamen coum I feature. Guess who gave them to me last December! They have stood outside my conservatory and have been a mass of colour for more than three months. They are in Peter’s compost and all I have done to them other than watering is to give them a light top dressing of fertiliser in January. Absolutely magnificent and I now relish the prospect of collecting masses of seed. Peter tells me, much to my surprise, that each pot contains only six corms! Peter has sent me some cultural information that I am passing on almost verbatim. Of course the Reading method he describes is tongue in cheek. Who would go to that trouble or really believe that such precision is needed for success. Even Peter’s own method is too finicky for me. If seed fall to the ground and germinate as well as they do, they must be easy to grow. I used to propagate my (rather easier) Cyclamen hederifolium at my old home by sowing 200 or so seeds in a seed tray of multi-purpose peat based compost on the day I collected them in September. They germinated within six weeks and overwintered outside at the base of a sheltered wall (I had no greenhouse then). They looked so sad when frozen solid on a cold Winter’s morning! Essentially my present method of propagation is the same as Peter’s below. Without the frills I still get the thrills. Don’t let his commentary put you off because it sounds difficult. If you collect fresh seed and sow them straight away you cannot fail. I have to tell you that when I collect seed from Peter’s fine plants I will sow them in trays in a mixture of my garden soil and and composted green-bin waste given to me recently to keep me sweet, by the municipal composter who operates up the road. If I told you what goes into his green waste product you would question my sanity. From the ridiculous to the sublime you might prefer Peter’s middle way! Compost: 80% fine peat:20% horticultural sand. To the peat component I add 2g per litre of dolomitic limestone and to the whole compost (peat + sand) I add 1.5g per litre of micro granule slow release fertiliser 6-9 month release. I usually make a batch of the peat/sand + chalk base mixture and then take out say 1 litre and add the slow release fertiliser when I need it. The base mixture keeps indefinitely. I use a plastic measuring jug to measure the volume of compost and on electronic kitchen scales (most will weigh as little as 1-2 g) to weigh the chalk and fertiliser. I sow the seeds and cover with a few mm of compost and then a few mm of alpine grit. The seeds will germinate equally well in a slightly heated propagator (at 10-20C) or in a cold glasshouse (or outside) but they germinate somewhat faster in the propagator. Germination occurs 3-6 weeks after sowing. I leave the seedlings in the seed trays for the whole of the first year and occasionally give them a feed with tomato food. They are not pricked out. The seedlings become dormant over the summer and I repot into individual pots in August – essentially after 1 years growth. Potting compost for the older plants is 3 parts peat or recycled compost – any that I have : 2 leafmould : 1 alpine grit. I rarely use new peat but if I do I add 2.0 g dolomitic limestone per litre of peat. To the whole compost I add 3g litre of 12-14 month slow release fertiliser. Again I make up a large batch of the base compost and only add the slow release fertiliser just before I use it. A few plants flower in their second growing season and all within 3 years. I am immensely grateful to Peter for his valuable and precise information. It is specially valuable to those who like to make their own compost - and lets face it there is an awful lot of commercial rubbish around. I make my own compost too, but I use my own garden soil and measure ingredients in dollops and slack-hands-full rather than with precision. I have commented before that the difference between John Innes 1 and 2 is 100% in strength and yet it is often a marginal decision which to use and one partly dictated by likely subsequent management. Peter shows his own flexibility too when he mentions reusing the cyclamen seed compost when he makes up his stronger potting compost in the second year. Who knows, growth of beneficial mycorrhiza might have got underway! Peter’s mixes are precise but I am certain that if a current mix is suitable for a different plant he will use it. If a plant such as cyclamen sows itself in the ground so readily it must be easy and the methods of growing are legion. I have often pricked or patched out self sown seedlings and potted then up for friends at any time of the year. Strictures against dry corms are about those out of the packet, not those from the soil. Soil-to-soil movement of plants is much more successful. When I used to have seed trays of hundreds of crowded corms one year on from seed - like in Peter’s picture - I would sow them like peas on my vegetable garden to grow on for their second year. 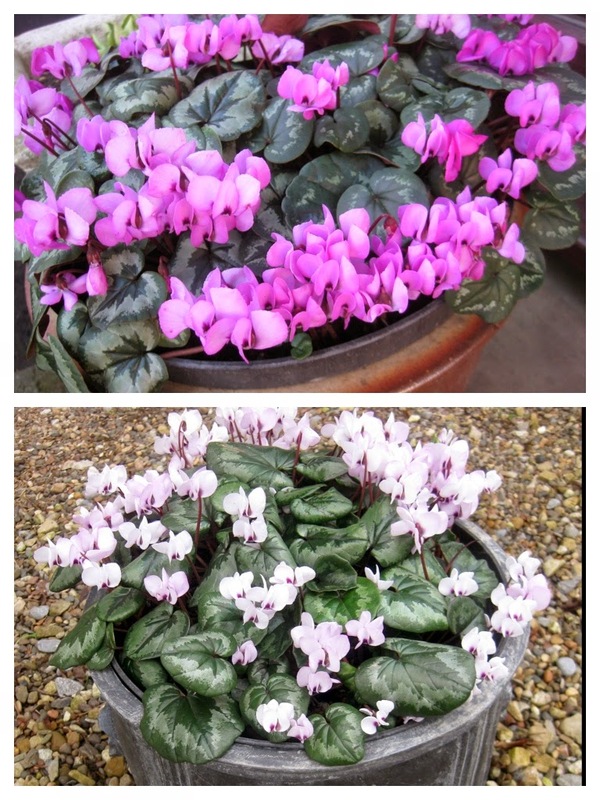 Peter also has a wonderful display of different species-cyclamen in his cold greenhouse. I will be there to read it Sue. Very interesting this post about cyclamen. Cyclamen hederifolium are indeed very easy and are selfseeding everywhere, may be with help of the ants, I have many of them too, haha. The Cyclamen coum is quite different and I am afraid they don't grow so well in my garden, I have tried them several times and still have some plants but they don't spread. I am wondering whether because my soil is sandy Cyclamen coum lacks some nutrient, perhaps a trace element or magnesium or calcium. I have been so pleased with the very long flowering of mine in the tub which had some of my yaramila complete fertiliser that this year I have sprinkled some around my outdoor ones and wait with interest if they are stronger next year. 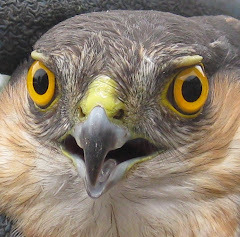 One of the most informative posts I have read in a long time Roger. I have one or two species growing from seed in the cold tunnel at the moment but I am now so inspired that I might actually buy in some plants, not a decision to be taken lightly, and collect my own seed from them. I grow most things from seed and do find cyclamen to be poor germinators even from good sources. No spending money on plants when you can propagate your own is not a good idea! Brenda has recently bullied me into replacing some of the plants we lost in the 2010 Winter. (i put up some resistance). I also mix my own potting compost - from home-made compost, leaf mould, the smallest grit I can collect from the quarry in a small trailer) and loam(well rotted down lawn edge trimmings). I mix it in a concrete mixer or for small amounts in a wheelbarrow. I find it more tolerant of wet or dry than commercial potting compost. I use about 20 bags for potting up plants for NGS sales in a year. Like you I have zillions of cyclamen hederifolium but fewer coum - they increase slowly and pop up in odd places sometimes - I put this down to human trafficking rather than extra fit ants. The corms of the hederifolium get to dinner plate size and are hardly going to slip in with another plant while being moved. Now thats a first for this blog Pauline, human trafficking of seed! Well more small corms I think! Yes you are quite right. In my case the greenhouse and everywhere. I also find Dicentra cucullaria coming up in unusual places! I rescued a dwarf cyclamen from the supermarket for a few pennies. As the pot was so small the leaves kept drooping I put it into a tray with the compost from a used up pot of herbs - parsley I think as an extra reserve of moisture. The flowers became seed pods, they ripened, but having read that they were difficult to germinate and required darkness and time, I decided not to bother. I noticed that there were lots of new leaves growing and many old ones were yellowing, so I pulled off the seed pods and yellowed leaves. The plant seemed fine sitting about a yard away from the kitchen window where it would be shaded when I pulled down the blind. I left the yellowed leaves and seed pods on the compost in the tray, shaded by the pot and the new leaves on the corm,and now, from the mouldy decayed layer of leaves there are tiny stems and leaves emerging with the same enthusiasm as mustard and cress. 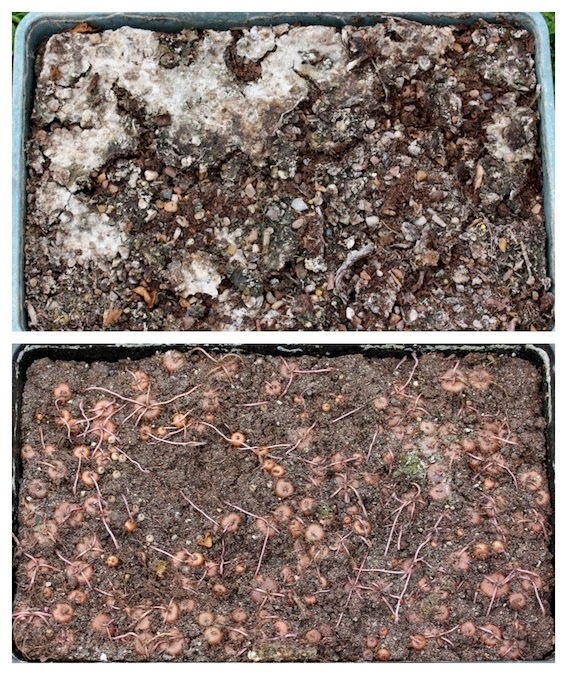 Obviously the way to germinate cyclamen seeds is to decide not to, just ignore them, take no care of them, don't put them in the dark, and don't ensure they are protected from mouldy decaying leaves. I just wish I was fonder of pink flowers. What a lovely story Anne. It just shows that if you watch and observe nature, have a sensitivity to plant needs - even if this means doing nothing, are not over tidy and 'hygienic' clearing plant debris it is worth a thousand cheap plastic propagators which I happen to believe kill more plants with damping off disease than they successfully grow. It could be the fungus associated with the decaying leaves maybe - or the house might sit on a conjunction of ley lines - new stalks are still emerging from the compost in the cyclamen tray, in the conservatory one of the amaryllis hippeastrum bulbs has put up a third flower stalk of four trumpets, the next one along put up two and the youngest just the one - when I grew courgettes in the garden I was rather overwhelmed by the numbers and the largest one I found was over 6lb, but there were lots more almost as big, hiding under the leaves. I had many years worth of marrow and ginger jam from them which was rather good on toast, but my enthusiasm for courgettes as a vegetable vanished entirely. Be warned - do not poke three courgette seeds into a well aged compost heap unless you have a large and courgette loving family to feed. Good soil, high winter light, warm, sufficient rain fall, no biting dry winds - you folk in the balmy south make me sick! If now, you have got began to build one vegetable patch in your yard of the house then you need to remember of the very fact that for making the raised vegetable patch you wish to own an excessive amount of area to create one.